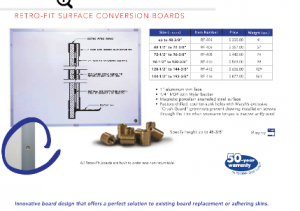 Choosing the right dry erase boards for your classrooms is more important than ever before. The ability to see instructional content and easily collaborate is fundamental in improving student outcomes. Designed for ultra short throw projectors, the latest IDEA™ Screen features upgraded durability, surface uniformity and rigidity to ensure a superior interactive experience. The erasable surface is hotspot-free under projection, and now comes with new standard features. All IDEA Screens are magnetic and have a thin frame. 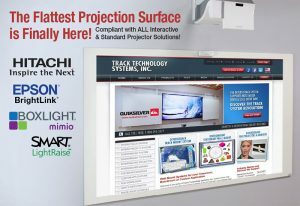 It can be used with an ultra short throw projector as an interactive screen or as a whiteboard with dry-erase markers. A tray for markers make the IDEA Screen a great upgrade to any classroom. Diversiboard Projector Board is a one-of-kind steel panel dry erase marker surface designed for uses in the classroom or boardroom. The board offers a matte or gloss surface and is ideal for use with a projector. 100% steel, never warps, guaranteed laser flat and compliant with all interactive projector requirements. Marsh Industries offers magnetic porcelain enameled steel surfaces and are built classroom tough with the 50 year warranty.